CEO says openess helps the entire electric vehicle industry, especially buses. If you know the world of electric buses, you know the name Proterra. The company has been making its all-electric buses go farther and farther on a charge and, thanks to fast charging, up to 700 miles in a single day. 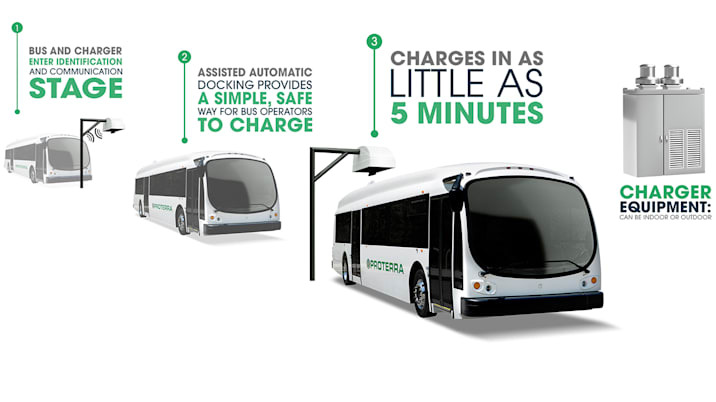 After all this work on its proprietary technology, Proterra announced today that it would open up its patents on "overhead on-route fast-charging technology to the transit industry on a royalty-free basis." In other words, Proterra CEO Ryan Popple is following the lead of Toyota and Tesla (where Popple was once senior director of finance) in opening up some green technology to outsiders. The three patents opened up today all relate to Proterra's Single Blade Charging Technology, which is the one Proterra found was the safest of the different methods it tried. You can see all 23 of Proterra's patents in the US Patent Collection here and a video of the system at work in the video above. We conducted an interview with Popple (via email because of logistical difficulties of a phone interview due to travel schedules) about the now-open patents. ABG: Which of Proterra's patents do you think will be most widely used by other companies? Which has the potential to actually make an impact for a company that isn't Proterra? RP: All three patents in concert are important for Proterra's Single Blade Charging Technology charging solution. As the market leader, Proterra believes we are in the best position to provide a solution that accelerates the industry. We've tried a lot of versions of overhead fast-charge technology and the Single Blade Charging Technology was the only one we commercialized, because it's the safest and most effective. If a transit agency has a bad experience with charging an electric bus, it will slow the entire industry, so we think it's beneficial to ensure that the solutions introduced to the market are safe. All of the patents to which Proterra is providing royalty-free access cover key aspects of the Single Blade Charging Technology and we believe that providing access to Proterra's Single Blade Charging Technology will benefit both sellers and customers by utilizing the best technical solution. One of the biggest things we aim to accomplish with this move is to show transit customers that the fast charging technology is open and available for anyone to use. This de-risks their uncertainty to switch to EV, because they won't be locked in to a single bus vendor. Some of our diesel and CNG bus competitors have argued that transit agencies shouldn't go electric because of vendor lock-in. This is no longer an issue, because now any bus manufacturer can use the Single Blade Charging Technology charging solution. Has any company or organization come to Proterra in the past and asked to license any of these patents? If so, which ones? "Making this available to others will hopefully accelerate EV adoption." RP: Yes, but unfortunately Proterra cannot comment on specific confidential commercial discussions. What we can say is that we've received demand from a number of large public transit agencies to license the technology for use by other bus manufacturers. We also see this technology helping other heavy-duty EV applications that are not transit, like delivery trucks and drayage trucks at ports. Right now, Proterra is focused exclusively on electrifying the bus transit market, which has about 70,000 buses in the US alone. We don't need to differentiate ourselves with overhead fast-charging technology in order to be successful in the market, rather making this available to others will hopefully accelerate EV adoption. We are confident competing on the performance of our vehicles. Does the royalty-free access to the patents have an end date or can third-parties use these patents, effectively, forever? RP: As described in more detail at Proterra's website, Proterra's royalty-free access to its Single Blade Charging Technology extends for the life of the patents. However, such royalty-free access will be terminated to any third-party that brings a patent infringement lawsuit against Proterra. What do you see is the most obvious use case for an outside company to uses these patent? Could this technology be applied to any vehicles other than buses? RP: The most obvious use case would be to charge electric buses, because it makes sense for heavy-duty vehicles that have high utilization. The Proterra Single Blade Charging Technology charge rate is about 8X higher than the CHAdeMO protocol and about 3X higher than the Tesla Supercharger. Proterra's Single Blade Charging Technology could also be used to charge other types of heavy-duty electric vehicles. BURLINGAME, CA, June 28, 2016– In a significant move intended to accelerate widespread EV technology adoption and infrastructure development, Proterra, the leading innovator in heavy-duty electric transportation, today announced it would be opening its overhead on-route fast-charging technology to the transit industry on a royalty-free basis. With the recent issuance of foundational patents covering this technology, Proterra is now clear to offer a complete technology package to the market. Proterra will grant anyone royalty-free access to its patents covering its industry leading single-blade overhead charging design. This includes the bus-mounted, single-blade charging design and the overhead charging coupler. Consistent with this, Proterra is working with its suppliers to open up Proterra's single-blade overhead charging design for direct sale to third parties. Industry-wide availability of the company's single-blade overhead charging design will advance standardization efforts and will facilitate additional innovation. For more details on Proterra's royalty-free access to its single blade technology, see www.proterra.com/charging-technology-details/. "As more and more electric buses operate on U.S. roads, it will be critical for the transit industry to have access to open technology platforms in order to effectively scale this technology and enhance the transit industry," said Lee Gibson, Regional Transportation Commission of Washoe County, Nevada. "With Proterra opening up its technology to other manufacturers, this will significantly benefit communities across the nation with this proven technology. Together they can move the industry forward." With more than 2.4 million miles of revenue service across the United States, Proterra has more battery-electric buses on the road today than any other manufacturer, and the Proterra single-blade overhead fast-charge system is the most utilized on-route charging technology in the industry. Over the past five years, public transit agencies across the country have performed more than 250,000 charging events using the Proterra single-blade overhead fast-charge system, providing these agencies with the flexibility of keeping their buses on the road all-day, and seamlessly integrating electric buses with existing route schedules. In order to meet the needs of transit operations, the single-blade vehicle coupling mechanism supports a charging voltage range of 250-1000 VDC, and can provide electrical current of up to 1400 amps, with safety taking the highest priority in these systems. Proterra's unique technology was specifically designed to limit exposure to high voltage components, unlike catenary or third-rail solutions. "At Proterra, we're focused on designing and manufacturing the safest, highest-performing EV transit solutions on the market, but we're also determined to enhance and expand the sector as a whole. We believe that everyone benefits from open platforms and greater customer choice," said Ryan Popple, CEO of Proterra. "We hope that this decision will encourage even more transit agencies to bring clean, quiet, emission-free vehicles to our city streets and community roadways." Proterra is a leader in the design and manufacture of zero-emission vehicles that enable bus fleet operators to significantly reduce operating costs while delivering clean, quiet transportation to the community. Proterra has sold more than 206 vehicles to 26 municipal and university transit agencies throughout North America. Proterra's configurable EV platform, battery and charging options make its buses well-suited for a wide range of transit and campus routes. With unmatched durability and energy efficiency based on rigorous U.S. certification testing, Proterra products are proudly designed, engineered and manufactured in America, with offices in Silicon Valley and South Carolina. For more information visit: http://www.proterra.com/ and follow us on Twitter @Proterra_Inc.